Spend a day with us learning the key tools, frameworks, techniques, and best practices for building database-backed applications. Gain hands-on experience developing database-backed applications with innovative and performance-enhancing methods. 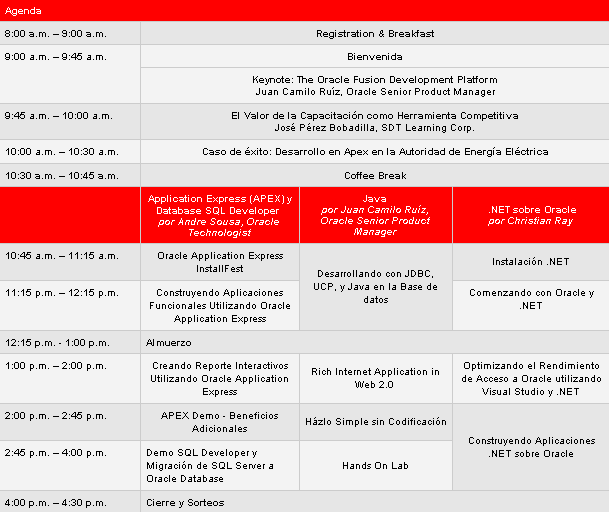 Meet, learn from, and network with Oracle database application development experts and your peers. Get a chance to win a Flip video camera and Oracle prizes, and enjoy post-event benefits such as advanced lab content downloads. Bring your own laptop (Windows, Linux, or Mac with minimum 2Gb RAM) and take away scripts, labs, and applications*. Space is limited. “Register Now” for this FREE event. Don’t miss your exclusive opportunity to meet with Oracle application development & database experts, win Oracle Trainings, and discuss today’s most vital application development topics.